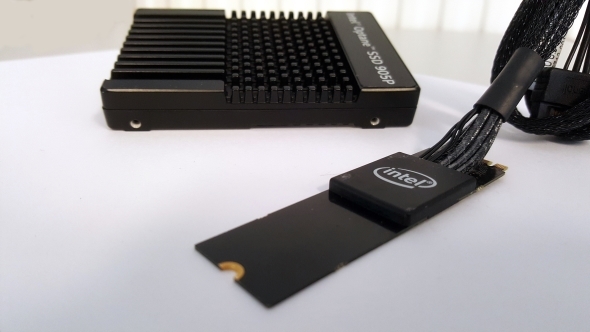 The Intel Optane SSD 905P is the latest refinement to the company’s first 3D XPoint memory SSDs. It’s packed with Intel’s most up to date memory controller and, in this U.2 form factor drive, 480GB worth of some seriously speedy storage. Intel and Micron have been working together on the 3D XPoint memory, and though it has taken a long time to finally get to market the performance makes it seem worth it. But as quick as it is, it’s also a mighty expensive SSD, with this 480GB version costing the same as the latest Samsung NVMe drives in full 1TB trim. That means it’s going to have to bring something special to the table. If you want the fastest storage around these are the best SSDs for gaming right now. But, unlike the Samsung 970 EVO, and its NAND flash-based ilk, there’s no performance difference between this 480GB version and the more expensive 960GB version. The modern 3D XPoint memory doesn’t get any benefit from the extra parallelism of a controller’s memory channels, and so boosting the number of memory chips in the SSD doesn’t deliver a corresponding boost in performance. The Intel Optane SSDs are designed to cater for either the workstation or the ultra enthusiast segment, in much the same way the Titan graphics cards from Nvidia are. By that you could take away that it might cost a lot of cash for the privilege of sticking the fastest storage on offer today into your PC. And you’d be right – at $595 (£530) it’s about as expensive, on a $/GB level, as any SSD on the market. But you are paying first for the development and secondly for these formative, Intel-only years of the nascent storage memory technology. The jointly developed 3D XPoint memory is designed specifically to offer speedy storage with lower latency, and massively higher endurance ratings, than SSDs’ traditional NAND flash memory. And one look at the 8.76PB endurance rating of the Optane SSD 905P will tell you as much. The Samsung 970 Pro, one of the finest, most robust consumer SSDs on the market right now, has a total bytes written (TBW) rating of just 1.2PB by contrast. That’s petabytes we’re talking about here, yes, we’ve got to that level in solid state storage. Feels good to be in the future, right? As well as having higher endurance figures the 3D XPoint memory also does away with the need for a DRAM cache to help it sort out the memory modules on board. There is no garbage collection or wear levelling that the controller needs to manage in order to keep an Optane SSD on the straight and narrow, making it much simpler for the drive itself to operate. It also has built-in power loss protection, something only very expensive commercial drives tend to have. So if you’re looking for a reliable SSD that can cope with even the most black-out-y power grid then the Optane SSD 905P is your drive. But it is a weird-looking thing, in this U.2 form factor anyway. It almost looks like a standard 2.5-inch SSD, but one that’s been clad in some sort of ribbed black armour. It’s there to keep the drive itself cool, acting as an all-encompassing heatsink around the memory modules and Intel memory controller. The 960GB version is a more standard add-in card form factor, fitting into a standard PCIe motherboard socket. Because most of us don’t have a motherboard with a U.2 connection, the Optane SSD 905P comes with an odd M.2 adapter. 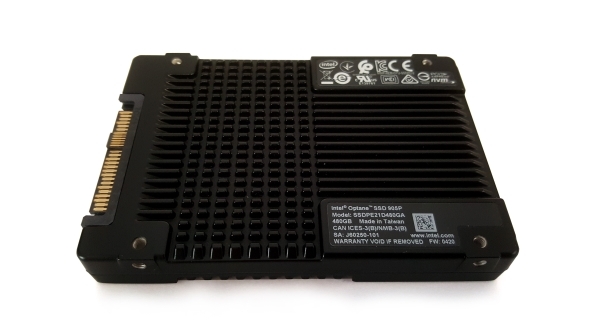 It offers a chunky cable, attached to a plain M.2 PCB that you plumb into a standard M.2 socket so the drive can run from the PCIe 3.0 x4 connection. You do also need to provide a SATA power cable to get it running too. Compared with a normal M.2 NVMe drive it does look a mess. Whatever the looks, can the drive’s performance make up for the weird looks and high price tag? Well, kinda yes. If you were just to look at the straight sequential read/write numbers you’d maybe think I was losing my edge – sure it’s not far off the sequential performance of the Samsung 970 EVO, but it’s twice the price. But those synthetic numbers don’t tell the whole story. A more telling test is the 4k random performance of the 905P – it’s hands down the fastest SSD we’ve ever tested. We’re talking three times the read performance of the previous quickest SSD. This small file benchmarking test is good for highlighting how well a drive will manage with the thousands of tiny reads and writes it will be tasked with on a daily basis when running a PC’s operating system, and this parity between read and write performance shows it’s a seriously slick drive in day-to-day use. It’s no slouch when it comes to straight file transfer performance either. Taking just over two minutes to shift 30GBs of varying files types is seriously quick, at some points it was operating at over 1GB/s. 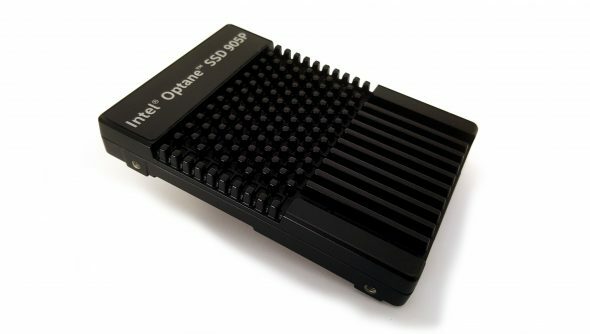 By those metrics the Intel Optane SSD 905P is one of the fastest drives we’ve ever tested and, with that monumental 8,760TB of expected storage life, it’s also one of the most robust. Hell, given that hard armoured shell, you’d probably expect as much. But it is also one of the most expensive too – you are very much paying the price of being an early adopter. Though with 3D XPoint 2.0 on the way soon, despite the news that Micron and Intel are looking at dissolving the current partnership, at least in its existing form, we’re hoping successive generations will bring the cost down. And hopefully we’ll even see Micron bringing out a lower-priced 3D XPoint drive itself in the not-too distant future. For now, though, this is as good a consumer SSD as you’ll find, but it’s also one that’s well out of reach of the normal gamer. For most of us a quality 500GB Samsung 970 EVO for half the price will see us right, but it feels like we’re on the cusp of a different future for SSDs.